Texting My Pancreas: #GiveAllTheThings: GlucoLift. UPDATE: Congratulations, Heather/AuntlyH! You've won! Last night's non-stop line in the 50's on my CGM graph leaves me in dire need of GlucoLift restocking. I would love a tart flavor - green apple from Dex4 is close (flavor-wise; other qualities lag far behind if you ask me), but I know GlucoLift can do better. What you can win: A glucose tab prize pack including one bottle of each flavor (Cherry, Wildberry, and Orange Cream), a travel tube, and some assorted stickers/tattoos! Why you want this: "Lows are horrible, but that doesn't mean that we have to accept a sub-par product just because it raises our blood sugar. We deserve something made from natural ingredients that tastes great, dissolves clean, and isn't chalky. And that works quickly and reliably. That's why I created GlucoLift All-Natural Glucose. Glucose tablets redesigned, by someone who actually has to use them." Leave a comment on this blog post telling me what the glucose tab flavor of your dreams is. (Mine is a tie: mint chocolate, or banana split.) This will earn you two entries. 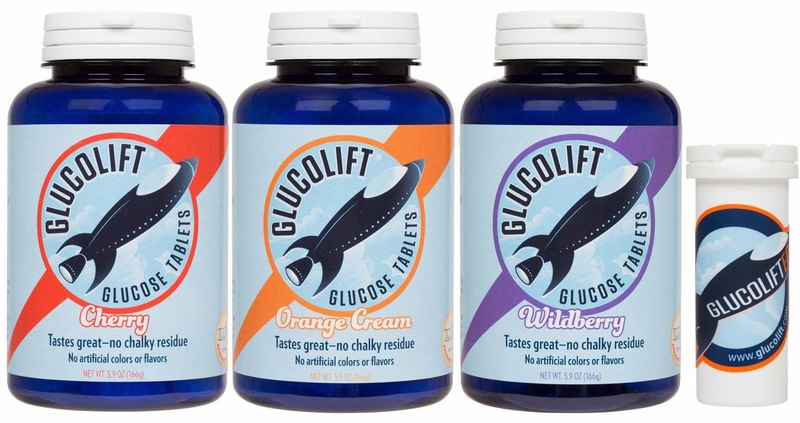 You may also earn one entry each for a Facebook Like or Twitter follow for GlucoLift, which means you can have your name in the hat up to FOUR TIMES! Rules: This contest ends tonight at midnight CST, and is open only to U.S. addresses. #GiveAllTheThings contests are intended for people with diabetes (or their caregivers) only. Since the Rafflecopter widget requires you to share an email address, I'll be emailing the winner (as well as announcing them through an update on this post) Saturday morning - you'll need to respond to me by Sunday evening (let's say 7:00 pm CST) with your shipping address in order to claim your prize. If I don't hear from you, I'll pick a new winner. I want caramel. Seems like that would be glucose-y! S'more. Definitely S'more. Bonus points if it tastes toasted. I'd be all about caramel or butterscotch....but I fear it would be chalky. How about making caramels with pure glucose? Sour apple - like a jolly rancher. YUM! My dream glucose tablet flavor is cake batter. CAKE BATTER EVERYTHING. All I want when I am low, is cake. Or frosting. I can second that sour apple! Or lemonade. My dream glucose tab flavor would be cookie dough. That would be amazing! I don't know if the texture of glucose tabs and the Speculoos Cookie Butter (Trader Joe's) flavor would go well together but I'd love to find out! Give me some tabs that taste like pumpkin pie or coconut/chocolate, please!! I would want Butterscotch glucose tabs! I have never thought of that until I started typing this comment. In fact I was going to make some Bacon joke but Butterscotch is a legit dream flavor now! BAM! How about coffee flavoured or Diet Coke. THOSE would be tasty. I would like to have sour green apple. Second would be coconut. Chocolate Peanut Butter. But I think that will defeat his whole "all natural" thing because there is no way to make that into a glucose tab. Just like a Diet Pepsi tab. A little difficult to make that legit too! I would love a mystery flavor tube! Each tab could be a different flavor. When I have low days I get tired of the same flavor over and over. I'm going to go with something super tart. LIME. I'm still bitter that the green Lifesavers and Skittles are green apple. So let's go with a super tart lime. Oh, and I followed and liked! Hope I win! My dream flavor would be raspberry or something tropical, mango perhaps? Pumpkin spice, or key lime pie! My dream flavor would be rum. If being low is like all the bad parts of being drunk....might as well have some fun, right?? Choosing An Insulin Pump: The Jedi Returns. #GiveAllTheThings: Coco The Monkey Books. #GiveAllTheThings: ipSOX (Insulin Pump Sox). First Impressions: Asante's Snap Insulin Pump. My Experience With Medtronic's Enlite CGM System. #GiveAllTheThings: WDD Blue Circle Shoelaces.